If you want something done, you have to do it yourself. This ideology is essential in the hip-hop culture & business. For a single LP, major labels invest colossal sums of money for a myriad of trendy producers and guest artists. Independent artists must depend on their own talent and persistence to ensure the creation of their art. 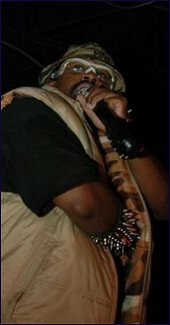 Distrakt is an emcee / producer who does not have the luxuries of major label backing, high populated cites for street promotion, or guest appearances on other artist's albums. Since he is based in Colorado, he did not have the support of New York City, Los Angeles, Chicago, or other major cities. Distrakt remained focused while maintaining creative control without the distractions of jewels, empty promises, spinning rims, groupies, clubs, and slimy labels. In late 2006, Yard Rock Records and Fat Beats released Distrakt's debut album titled, "Distraktions". The LP is 100% of Distrakt. He produced, mixed, engineered, and recorded every single track. The minimal amount of songs with additional vocal appearances are by unknowns. Distrakt even created the CD's enhanced section by himself. The foundation of complete creative control was the sunlight for Distrakt's album to bloom. The clever song, "Drugs" showcases an emcee's addiction to hip-hop. In the song "Lessons", Distrakt uses a sharp wit to tell tales of people forced to learn from their mistakes. "Dirty Record" is a witty song about crate digging and how people mistreat the sacred vinyl, the heart of the hip-hop art-form. Other solid tracks include "Fire Escape", "Few Bars", and "Don't Get Mad". As an album, "Distraktions" is a refreshing distraction from the watered-down forced-fed hip-hop that engulfs us. Distrakt deserves respect simply for his endurance, persistence, creative control, and self-reliance. This actual interview was made possible because of Distrakt's persistence. He did not have the help of a publicity company or publicist. Distrakt was the one who hunted me. If anyone thinks that hip-hop is lacking the hunger of years ago, Distrakt proves them wrong. MVRemix: Tell us about your first release, 'Distraktions' released on Yard Rock Records and Fat Beats. Distrakt: It's a record that came natural. I discussed subject matters like staying focused, surviving, watching out for snakes, and giving it back to the pioneers & fathers who blessed us with hip-hop. If it weren't for them, I don't know what I would be doing. MVRemix: You produced the entire 'Distraktions' LP. These days, hip-hop albums have a myriad of different producers for each track. Was this an intentional move? Distrakt: This was very intentional. I love to create beat designs to rhyme to. There are not that many dope emcee producers out there. I wanted to add on as greats like Rza, Diamond D, Extra P, and MF Doom. MVRemix: What song on the 'Distraktions' LP took the longest to complete? Why? Distrakt: Everything flowed on this record. The process was mad nice. I worked on the beats for a few days. Then, I went back and started writing to the joints that talked to me. I didn't force anything. I just treated this album like I was digging for dope records in an old, underground, incense-smell filled, used funk & soul record store. MVRemix: Do you have a favorite track on the 'Distraktions' LP? Why? Distrakt: All of them are my favorite, but "#! *@ Ain't Sweet" really takes me there. That song truly displays my feelings on how cats take kindness for a weakness. So, I just had to wave an ammonia capsule under their noses to let them know that Distrakt is no slouch. MVRemix: When creating a track, do you have a pre-conceived theme and pre-written lyrics? Or, do you start with an idea or the music first? Distrakt: I let the beats dictate the rhymes on this one. When I hear beats and see how they bump through the speakers, I fill in the pockets with rhymes. This process is one of many in my creative pulse. I am a think-tank. Every project I approach will have a different process or it will be mixed with a combination of previous elements. But, it will always be original. MVRemix: How did you hook up with Yard Rock Records? Distrakt: Through ambition, research, and motivation. MVRemix: What is the meaning behind your name, Distrakt? Distrakt: D.I.S.T.R.A.K.T. stands for 'Developing Infinite Sounds Truly Revolutionizing All Known Thought'. You'll never know what to expect from me, like to get in and get out. MVRemix: Tell us about the enhanced section of the 'Distraktions' CD. Distrakt: This was a way to take the CD a little further and give you a demonstration of what it's like in Distrakt world. Those who have not seen my live performance, get the opportunity to experience a dose. The things I do in shows are not the average conventional performance. I wanted to document this, being the first to do many of those things. You have to see a live Distrakt show. Distrakt: Catching people off guard and shocking them with the unexpected. Distrakt: Missed opportunities waiting on others. That's why I'm a solo artist now. If you want something done right, you have to do it yourself. MVRemix: The atom is part of your signature visual emblem. Why did you choose this and what is the significance of the atom to you? MVRemix: What do you love about crate digging? Distrakt: Discovering new hits and sounds. Album covers are inspiring and seeing the growth of music in all genres is cool. MVRemix: As a producer, would you ever make an instrumental LP? What instrumental albums did you like best? Why? In your opinion, what makes a solid instrumental hip-hop album? Distrakt: One day. 'Hydra Beats The Next Level Vol.1' by Godfather Don, J Dilla's 'The Shining', 'Donuts Instrumentals', and Madlib's 'Beat Konducta Volumes 1-2: Movie Scenes'. Longevity. The difference between a fad beat and a classic beat is the difference. "I let the beats dictate the rhymes on this one. When I hear beats and see how they bump through the speakers, I fill in the pockets with rhymes. This process is one of many in my creative pulse."